I do believe that my husband and Captain epitomizes that quote 😉 I have added a page to the blog, “50+ Years of Boats, The History of Al’s Boats,” just to document how long his boat obsession has existed. 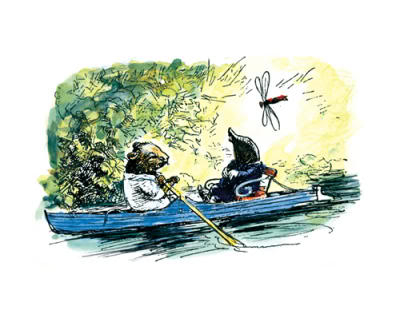 There have been a few moments over the past year that I considered this possibility – Al needed a new boat to work on. After 12 years with our Morgan 43, he had done everything he possibly could to make it comfortable and beautiful. There was nothing left to do or mess with. He needed a new boat to rescue. 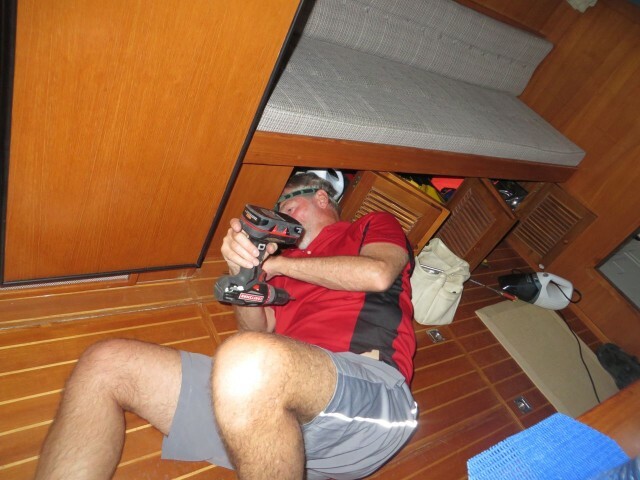 After sending this photo of Al, dismantling the settee on the starboard side while underway from the Chesapeake, Dan wrote to us — “Don’t do it man. Stinkpots are ok. I love yours. Move the bit away from your heart. Dan xxoo” On closer inspection, I saw what he meant — See where the drill is pointing??? After reading about our final leg of the journey home with the new Kindred Spirit, Al’s son, Tim, also had a comment, “I think he passed down the ‘rip into it as soon as possible’ gene to me.” Tim and his wife Amanda have been living and wandering around western US for over two years now in a 25-foot Airstream RV. 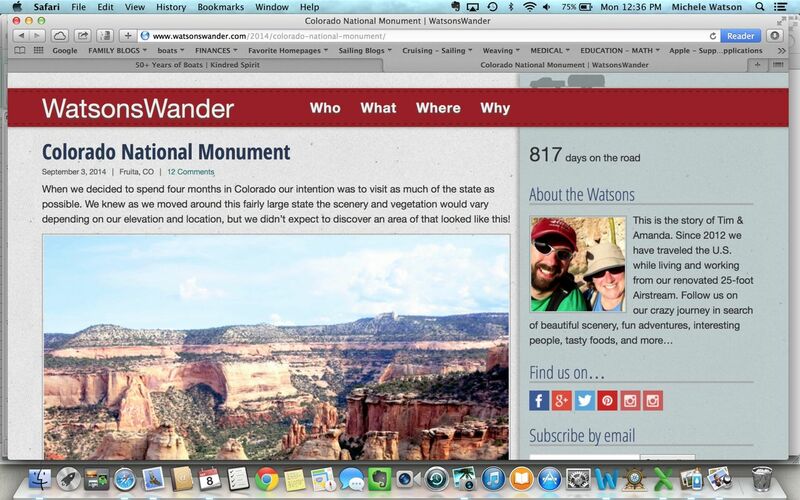 They have an amazing blog about their adventures and life on wheels, WatsonsWander. Tim and Amanda’s Watsons Wander blog. What happened after he ripped the salon bench out?? He now has comfy chairs! Al has always wanted an IKEA poang chair because it is so comfortable for his back. IKEA – you have to put it together yourself. No problem! TWO IKEA poangs in the salon for relaxed and comfortable seating. The trapezoid shaped table between he chairs will become a finished table with storage. 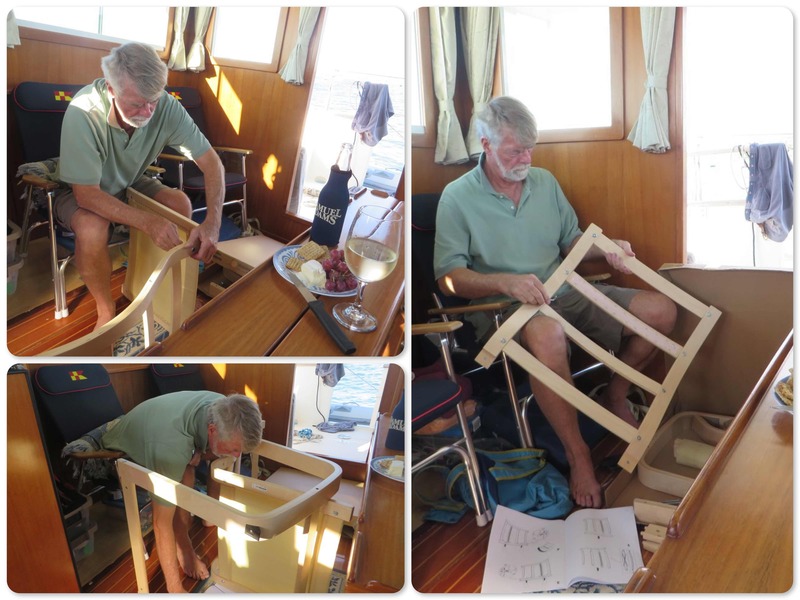 Let’s see what else Al has already accomplished on our 6-week old boat. Some projects are relatively “small” and some are fairly major. In 20 years of boating together, I can count on one hand the number of times that we have hired someone to do a job on our boat. Al spends a lot of time with floor panels lifted up, tools spread all over, working on something. Or just messing about. 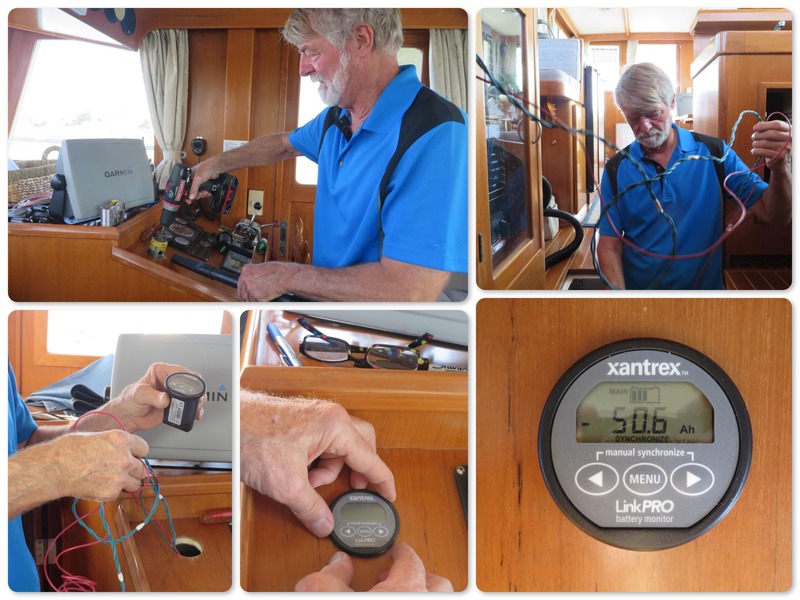 We found it hard to believe that this boat did not have a battery monitor when we took possession of it. It was frustrating to have no idea about the state of the battery bank as we traveled home from the Chesapeake Bay. 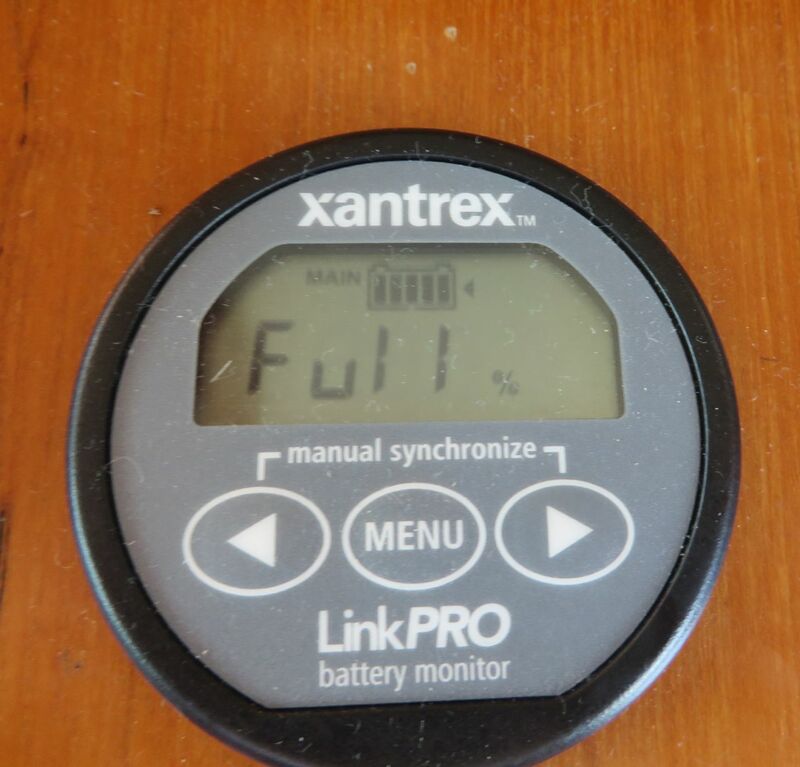 In fact, Unfunded Requirement did have a battery monitor — Al found one, a Xantrex Linkpro Battery Monitor, uninstalled and still new in its package. Go figure. Naturally, he immediately installed it. What is a Xantrex Link Pro?? (When he first said he found a Xantrex, I thought he was referring to xanax, the drug for anxiety. LOL) It’s a device that selectively displays voltage, charge and discharge current, consumed amp hours, remaining battery capacity and the time remaining of the battery bank. Things that are very good to know. Another device related to power on a boat is a DC/AC power inverter. Power inverters convert direct current (DC), the power that comes from a car (or boat) battery, into alternating current (AC), the kind of higher voltage power supplied to your house, and the power larger electronics need to function. (That’s all I know, except how to turn it on and off.) 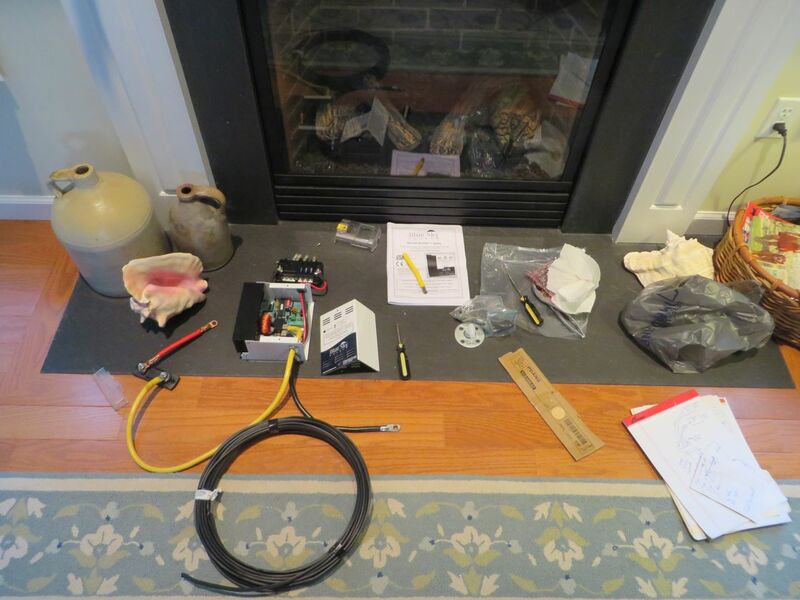 It is handy to have an inverter onboard for charging some electronic devices such as a laptop, or for running a tv (which we do not have as yet.) Large capacity inverters can also be used for a blow dryer or a curling iron, but I have never bothered to even bring those along on boating trips. 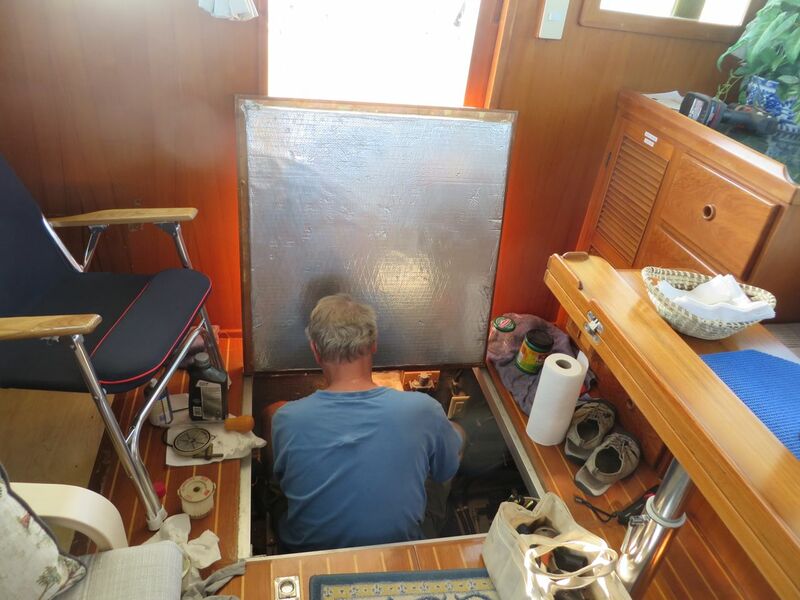 The inverter was located under the floor – VERY heavy to lift when you want to turn it on. Didn’t make much sense, to say the least. Al moved it to the space inside the steps down to the cabin. Just lift the top up and flip the switch! A small project was hanging our coffee mugs on hooks. There just wasn’t enough storage space (lack of galley storage will become a separate blog post during this winter when Al rips into that!) We have a small collection of mugs from special ports we visit, including Block Island, Fishers Island, Cuttyhunk, Martha’s Vineyard, Nantucket, Skinny Legs in St John, and the Bahamas. We have more mugs than we can carry on the boat. I think they look nice hanging there. And the hooks are special with an extra clasp so none will flip off in rough seas. We hope…..
We kept our 73-pound Rocna anchor from the Morgan. 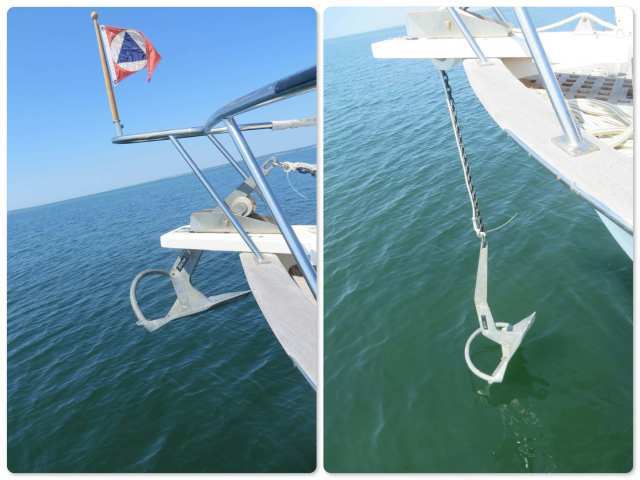 That anchor helped us to sleep well at night all the way south and in the Bahamas. 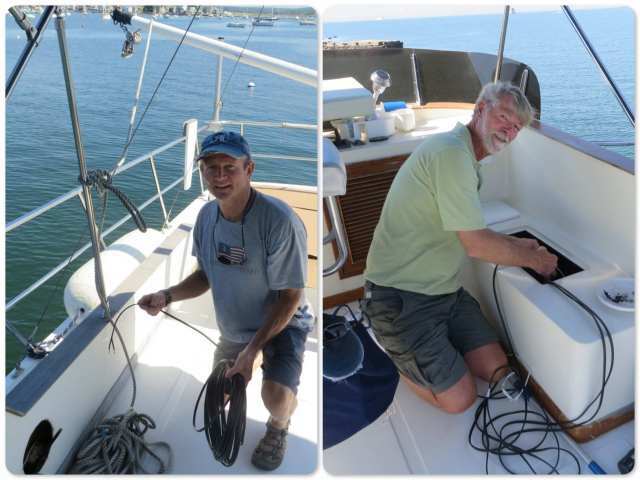 We are quite glad that we kept it because the Mariner Orient 38 came with a rather minimal anchor capacity and an embarrassing rode – only 16 feet of chain and then all rope. Al added 50 feet of chain that we had in the attic and our Rocna. We will be adding all chain over the winter!! Rocna hanging just under the bow and deployed into the water. The Mariner did not have davits for the dinghy. 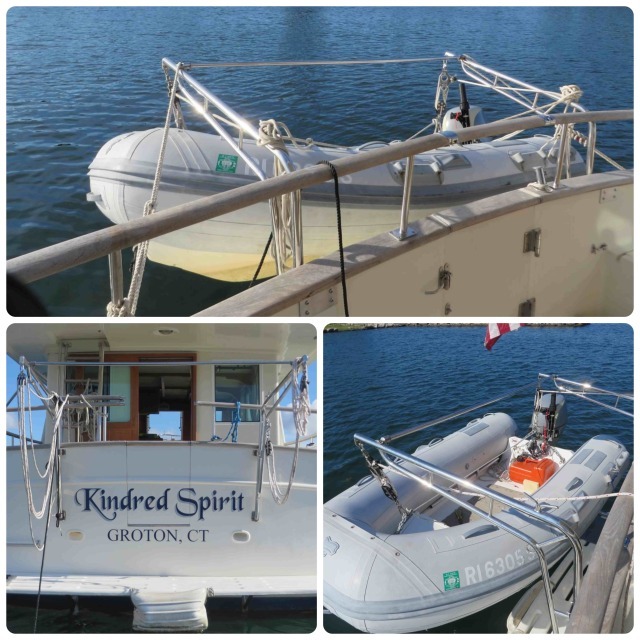 Instead, like many trawlers, the dinghy is kept on top of the flybridge and lowered with a crane system. Awkward and time consuming. 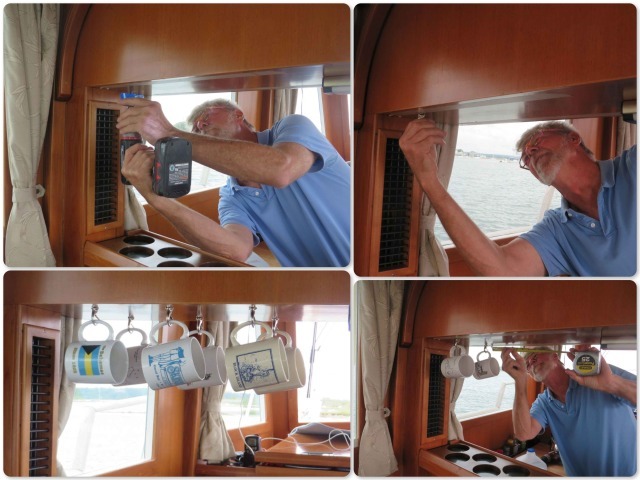 Al found Kato arms on eBay and worked with Kato Marine to find the right mounting brackets. Kato was exceptionally good about communicating and working with him. The davits are terrific. 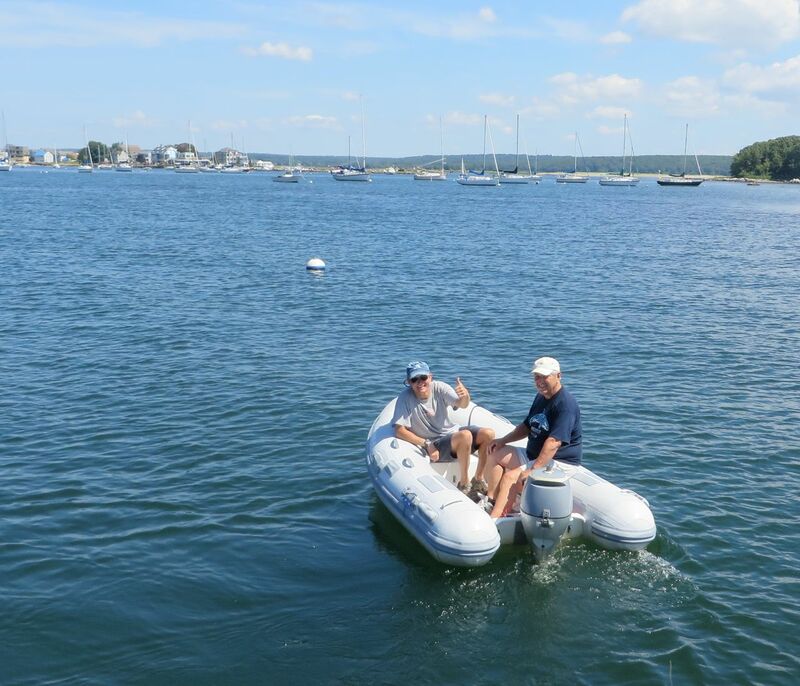 Once again, we can deploy the dinghy quickly and easily. 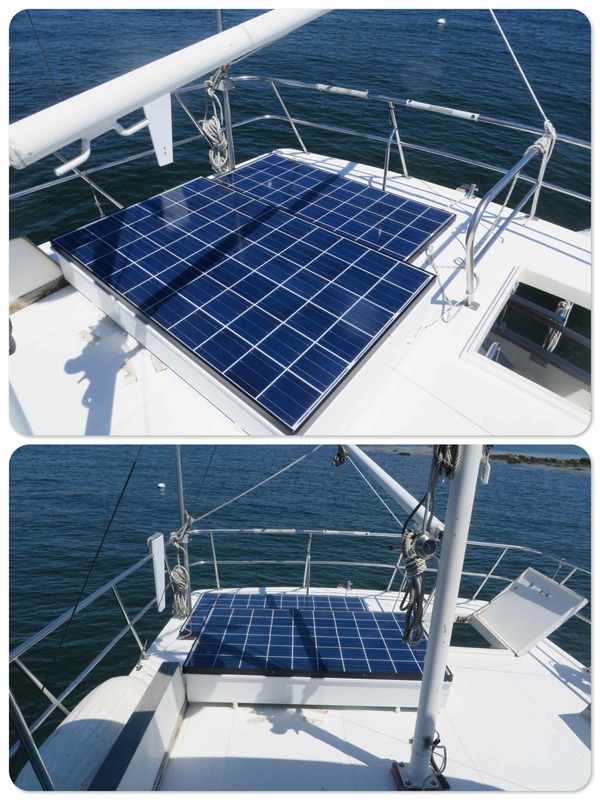 The biggest boat project to date was adding solar panels. 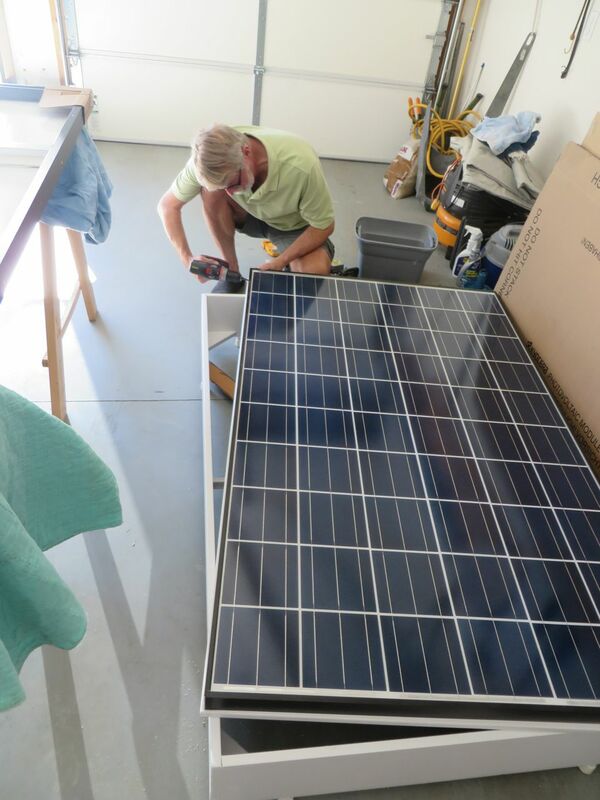 We loved our solar on the Morgan, and there have tremendous improvements in solar since then (about 10 years ago). 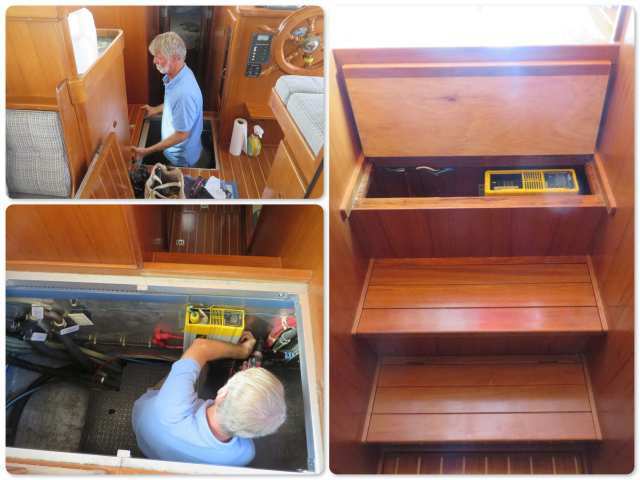 Al installed two 250 watt panels on the flybridge, where the sailing dinghy was. First he builds a “box” in our garage. The hinged top will hold one panel and there will be storage below it. 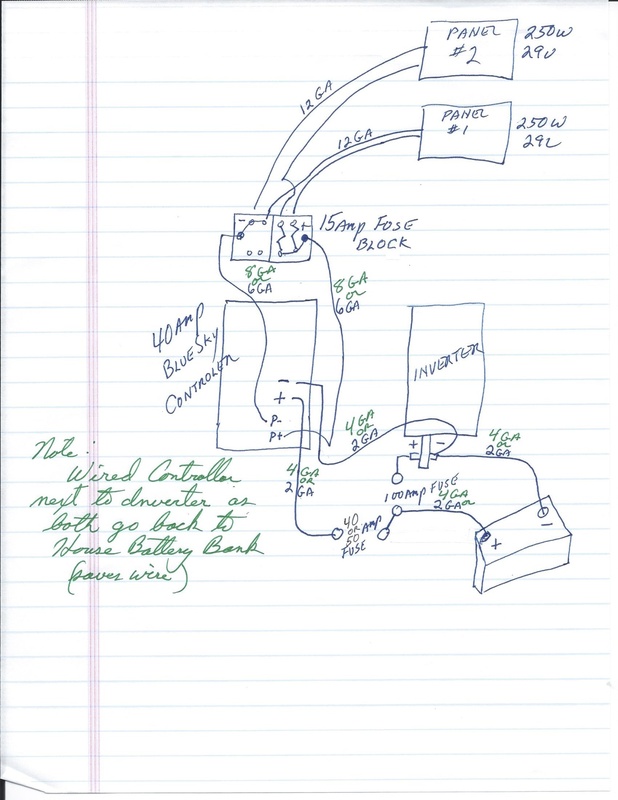 A sketch of the wiring diagram. The solar panels are from Arizona Wind and Sun and the controller is a Blue Sky MPPT. The panels are loaded in the back of the truck. 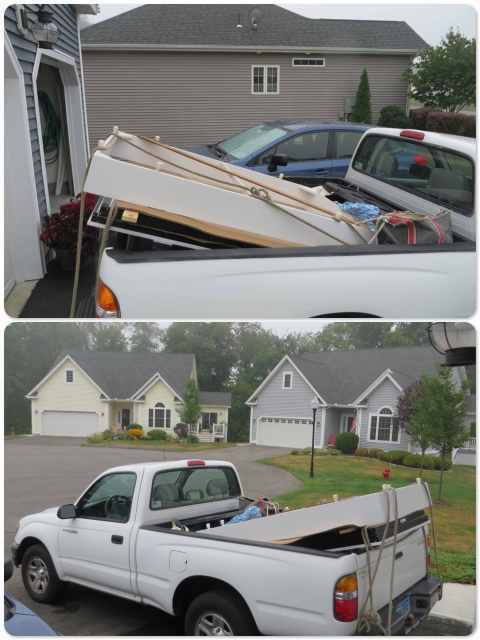 With his buddies, Dan and Gil, Al is off to install the solar panels. 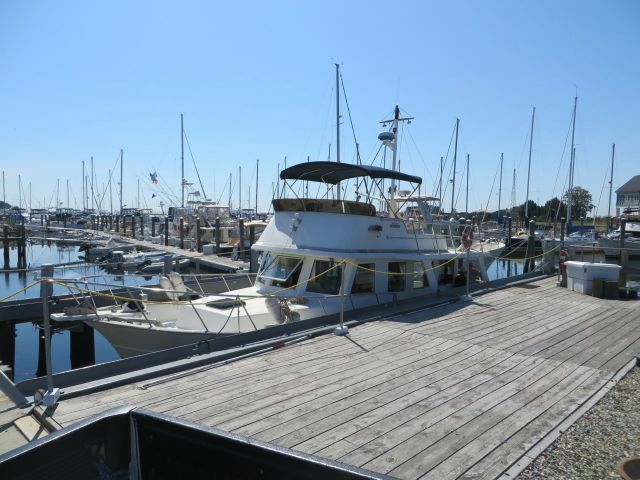 Al brought the boat into the lift well so that it would be easier to get them up on top of the flybridge. Not something you want to do out on a mooring! Dan and Al messing about with wires up top while Gil is pulling them down below. 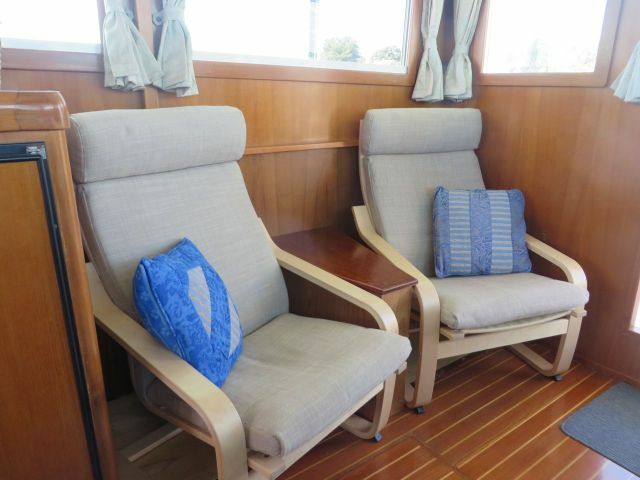 Solar installed on the flybridge – plenty of room! Al’s buddies, Dan and Gil, depart with a thumbs up signal! Success! 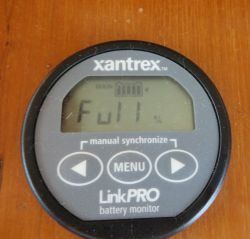 The Xantrex monitor reads “FULL.” Free power from the sun – you gotta love it!